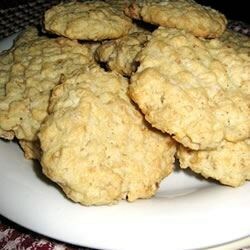 "These cookies are very good and I got this out of my mother's personal recipes. This recipe is from a Lebanese woman who was a friend of my mother's." Set aside boiled water and cool until lukewarm. Mix butter, shortening, coconut, oats, sugar, flour, baking powder, baking soda and salt with fingers until dough reaches the consistency of pie crust. Add lukewarm water and work into dough. Make dough into one inch balls. Flatten with a fork or fancy bottomed glass for imprint. Place on greased cookie sheets and bake at 400 degrees F (205 degrees C) for 10 minutes. A quick and easy way to bake cookies using a package of cake mix. My husband was lebanese, but he always wanted me to cook him these cookies, so I divorced him. Im jordanian, and I assure you, there is no such recipe for cookies around here. They're alright to make anyway, add a bit more coconut than it states though. This looks great .... im an arab and these cookies are one of the best from the tradtitional recipes we have. I made these cookies for my company's cookies around the world day. And I didnt get a chance to take any home. They flew like hot cakes. This is an easy recipe with big flavor!!! it had an amazing taste! Very hardy cookie and tasty.